Swamp Popper "Should Go On Forever"
Best known for hitting hard in 1959 with his buddy Guitar Gable's bayou ballad "This Should Go On Forever," Rod Bernard came close to suffering rock 'n' roll shell shock when he went from having the song rejected by local radio stations for being "too bad" to possessing the dual honor of being an exclusive Chess recording artist and having his biggest hit banned in certain locales when the line "If it's sin to really love you, then a sinner I will be…" offended certain sensibilities that weren't as relaxed as those in South Louisiana. Prior to the success of "Forever," the events of Bernard's young life informed his future as a swamp pop pioneer in several interesting ways. Ten years old and dreaming of having his own radio show, Rod found a sponsor in the Main Motor Company of his hometown of Opelousas and snagged a fifteen minute weekly show singing country songs on KSLO. Within two years he was a disc jockey at the station, only having to pull up stakes in 1954 when his family moved to Winnie, Texas. As fate would have it, Rod's barber was Huey P. Meaux, who would go on to make an indelible impression in the swamp pop scene just a few short years later as a producer, label owner and all around hustler. Upon the family's return to Opelousas the following year, Rod put together his first band, the Twisters, with whom he recorded his debut record in 1957. Released on Carl Records, "Linda Gail" and "Little Bitty Mama" were South Louisiana rock 'n' roll in its purest form: A bunch of teenagers recording live to one microphone at the now legendary Southern Club on Highway 190. 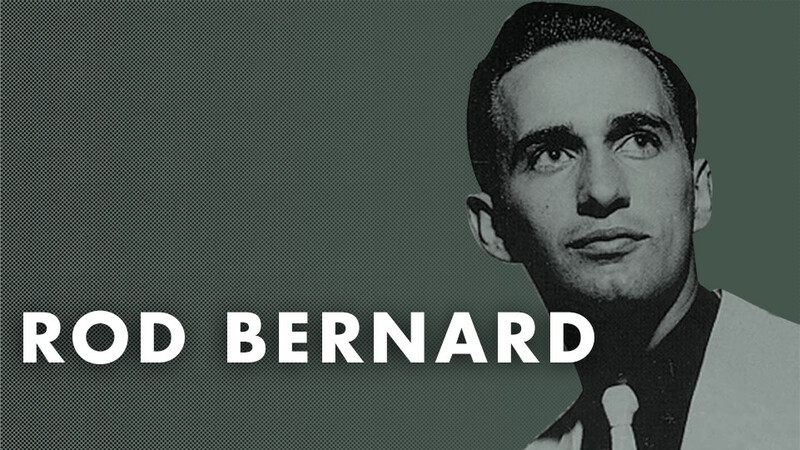 Though Bernard was never able to duplicate the success of his biggest hit, the quality releases continued throughout the sixties on a series of labels that included Teardrop, Hall-Way and Arbee. In '62 Rod formed the Shondells with fellow South Louisiana rockers Warren Storm and Skip Stewart, and they released the excellent "The Shondells Live At The Saturday Hop" on La Louisianne. The highlight of the Shondells had to be their piss-take on the current music scene in 1965 with Rod's answer to the British Invasion, the hilariously biting "Recorded In England." Bernard furthered the coolness quotient by cutting an album with Clifton Chenier, "Boogie In Black And White" in 1976.